Truedor is delighted to announce the availability of a new security cylinder across its full range of Composite Doors. The UAP Kinetica Kitemarked high security 3*cylinder is available immediately as an option for trade customers wanting to offer an even more high security product to their customers. 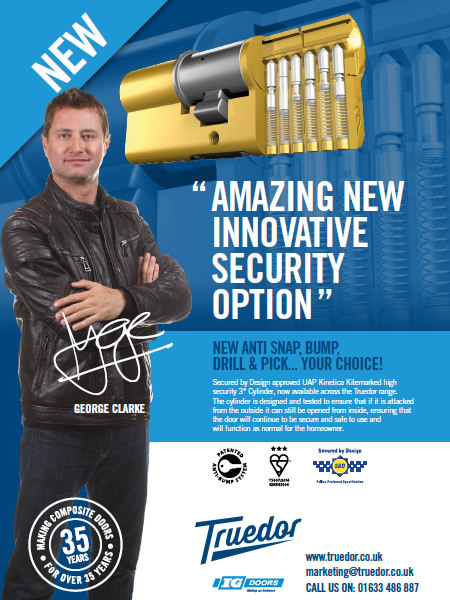 The Secured by Design approved cylinder comes with anti-snap, anti-bump, anti-drill and anti-tilt features which further enhance its security credentials. The cylinder is also designed and tested to ensure that if it is attacked from the outside it can still be opened from inside, ensuring that the door will continue to be secure and safe to use and will function as normal for the homeowner. Speaking for Truedor, Sales and Marketing Manager Richard Kirman commented “We are really delighted to be able to offer this cylinder to our trade customers. Our design and technical teams are continually looking at how we can improve the Truedor product even further, and this new security feature is the latest part of that process”. “There are a great many technical features in the cylinder, but the bottom line is that it is even more secure than many other products on the market, whilst crucially giving the consumer peace of mind that in the event of attack their doors will remain secure and fully operational – this is a big plus point for me”. “As a separate point, the cylinder is also available in a keyed-alike or master-suite option, which gives us another USP for our customers”.